CHEONGDO, South Korea: There is no blood, nor much gore. No matador, either, or even his colorful cloak. In South Korea, bull fights bull. "When I wake up, the first thing I do is train my bulls, letting them drag tires. Then, I feed them with nutritious porridge," said Lee Jin-gu, a 59-year old rancher who has trained fighting bulls for seven years. "I once stayed in the pens, sleeping next to my bulls for a week," said Lee, who had four of his prize Korean bulls fighting their way through to the quarter-finals. In one bout, last year's champion, "Fighting", clashed with "Ggoltong", which means "Dullard," bellowing as he entered the ring and spectators cheered. After about three minutes of shoving amid the clattering of horns, billowing dust and shouting fans, their duel was finished. "Fighting" made it through to the next round as his defeated opponent gave way and trotted from the ring. "I was fearful if our bull lost the fight because my parents would scold me," says Son Mal-jook, 68, who used to take fodder to the creatures when she was a young girl. "Spain's bullfight is between man and bull and assumes that men will defeat bulls," said Lee Joong Geun, county executive of Cheongdo. "But Cheongdo's bullfighting is an energetic fight between two bulls." "In the (United) States, I have seen rodeo, bronco riding, bull riding and also roping. 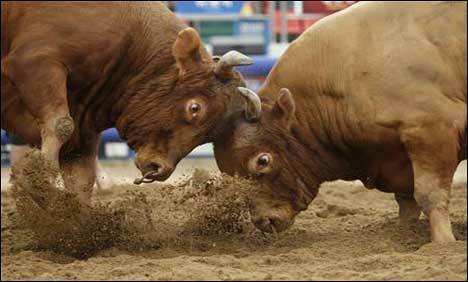 But I have never seen two bulls fighting each other before," said Maria Oliveira. Lee Jin-gu, Fighting's owner, confessed to a deep affection for his animal.